And my personal favourite... 52 ways to simplify your life. A real list. 52 ways to make your life less complicated. That sounds like a whole load of effort and things to do to just make life simpler! Anyway, I read these lists and sometimes pick up some great little tips, but more often than not they overwhelm me. It's too much information, too much expectation and just makes me feel inadequate as a mother, or a woman, or in running a house. I try so hard, but there are days when just getting through the day is the goal. I think we all just need to cut ourselves some slack. I read a lot of blogs and people can make it seem have it all sorted: they have carb free, gluten free, sugar free diets; they get up an hour earlier than their family to pray just like the woman in Proverbs 31; a household chore list than never runs behind schedule; zero clutter; a fit and healthy body; and 6 homeschooled, happy children. Real life for me is a three bed semi detached house (I’m guessing clutter isn't as much of a problem if you have big house, or a garage, neither of which I have), church commitments, freelance work in my evenings, stay at home mum to two boys, trying to run a home, and throw in more hospital appointments for the three men in my life in a year than most people have in a year and to be honest, living simply often feels like a pipe dream. - Preserving as much weekend time to do nothing as we can. We rarely attend birthday parties and try to spend a significant amount of our weekend as a family. At the stage of life we’re at we’re just coming into the crazy busy season many of our friends are in with sport on Saturday mornings, swimming lessons, church kids clubs, lots of class birthday parties and we have made a conscious decision to preserve this weekend time as much as possible. At this stage I can’t see us sending the boys routinely to birthday parties or doing sport while in the lower half of primary school anyway. This more simple style weekend works for us and helps us give some breathing space and rest at the end of each week. - Saying no to things altogether. Lots of people feel the need to say yes when people ask them to do something but I try to say, “I’ll get back to you” or“Let me have a think about it” and if it doesn’t work for me, I will say no. Having said that, at church alone Colin takes Sunday School, I take the beginners class (for playgroup age), I take GB on Tuesday evenings and play the piano in church on occasion too. So maybe I’m not great at saying no…! - Deciding in certain seasons to say no. This is different to saying a total no, but knowing that at certain times in your life you can change your yeses to a no. I was a leader of the GB in our church for a few years, which was an early evening commitment on a weeknight, but found it tough going to do when Daniel was a young baby (I took about 4 months off) and into toddlerhood when I was back at work. 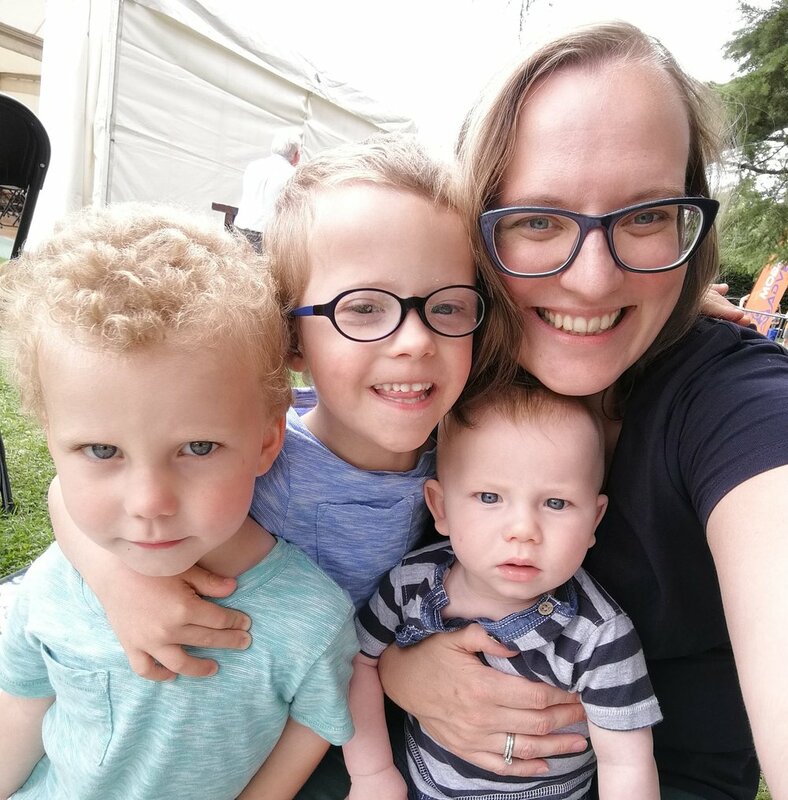 We took a decision for me to take some time off when we were hoping to get pregnant with baby two, which meant I had a year off when pregnant and a year off when Rory was young and returned this autumn. It is ok to take time off ministries for a period of time, to step off the school parent-teacher group for a year, to give up a hobby or evening class for a term. If you’re feeling overwhelmed with the schedule, this may be the solution! - We take a screen free period of time when we’re feeling overwhelmed. In February this year we went screen free. Well, I did, Colin decided to go off social media (mostly) while I went more fully into it, but the principle was there that I wasn’t using the internet to google “What tooth comes through next in a baby” or “How long does it take to cook a pork chop?”. I felt more grounded in my day to day life and enjoyed not having the drip drip of social media throughout my day. I’ve got bad at letting it slip back and could do with more simplicity these days. Time for restricting my screen use again I think! - Eliminating decision fatigue. Daniel doesn’t have a set school uniform this year apart from his jumper but to save me thinking about each element of the uniform each day I decided to buy 4 plain navy bottoms, plain white tshirts, blue socks and a pair of white trainers and that’s his ‘uniform’. We do it with food too - I used to do this better with set types of food for dinner each evening but now I plan for the week with some days the same (fish on Mondays, veggie on Tuesdays) and it means I never have the last minute panic at 4.30pm as to what’s for dinner. I realise the journey to simplicity is a long one, and I’ve so many steps I could still make. Life often seems overwhelming and I’d love to make it much simpler. I know that decluttering my possessions, my decisions and my schedule will all make life feel lighter. Harder to do though, isn’t it?